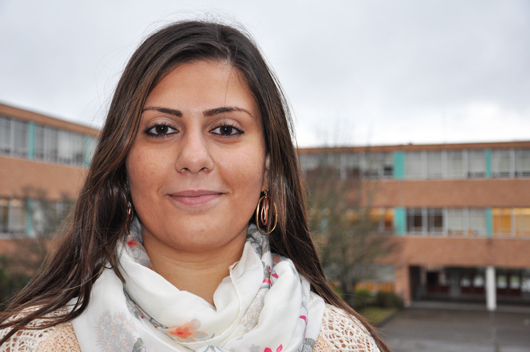 In 2011, when Grace Aaraj, a 21 year old student from Beirut, Lebanon, wrote those words as part of her autobiographical essay included in both her Fulbright scholarship application and her application for graduate studies with the Department of Architecture at the UO, she had little idea just how many new and richly diverse experiences would unfold for her in the United States. 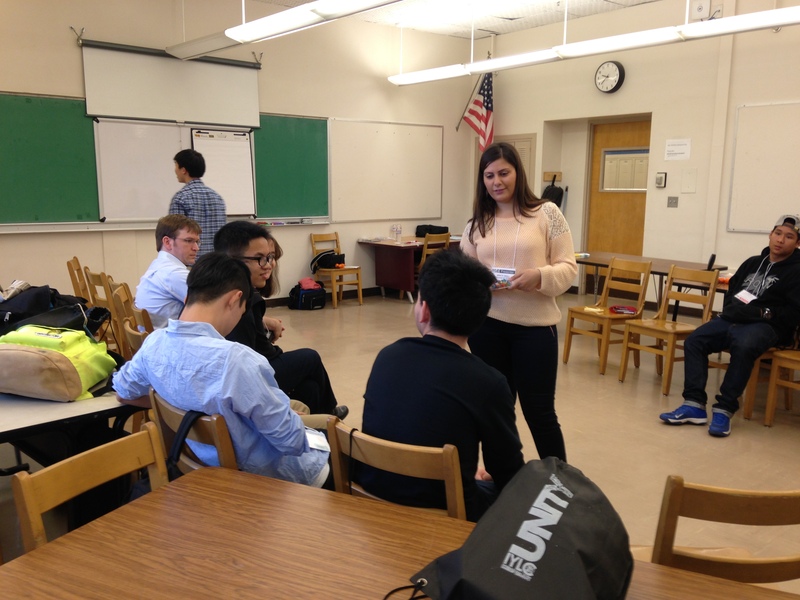 Like many international exchange students, she came to the United States with an empathic idealism enthusiastic to meet new friends, and connect across cultural lines challenging any divides and stereotypes by sharing stories, tastes, conversation and advocating cooperation and collaboration. Her gregarious nature and generous spirit were met with varying degrees of acceptance—here was a young female of Middle Eastern in descent in an environment traditionally dominated by masculine presence and Western expectations. Not daunted by possible perceptions of her background and culture, Aaraj’s experience at the University of Oregon has illuminated and enhanced an outlook where she was able to expand her frame of reference and gain invaluable academic and professional-related experience. As she is quick to point out, coming to the United States to study and immerse herself in graduate studies, she had divergent paths to chose from: adopt and adapt to the new and unusual or withdraw into a secluded course of study and academia. One path would give her experience in-the-field of architecture and design and invaluable networking opportunities; the other, a quiet yet dedicated focus on study and research. In the nurturing and experience-driven environment of the University, she says, she was encouraged her to explore possibility in both the classroom and the community—the paths of solitary academic study brilliantly enhanced by internships with architectural firms and presentations to professional conferences. Into this atmosphere of connection and opportunity, Aaraj has been able to blend a background rooted in Middle Eastern tradition and embrace the professional opportunity she has been afforded while a student at the UO. As she so proudly asserts, her parents raised her to respect all people, not only those just like her, and to appreciate and create opportunity. And, Aaraj points out, it has been her egalitarian outlook that has blossomed at the University of Oregon. 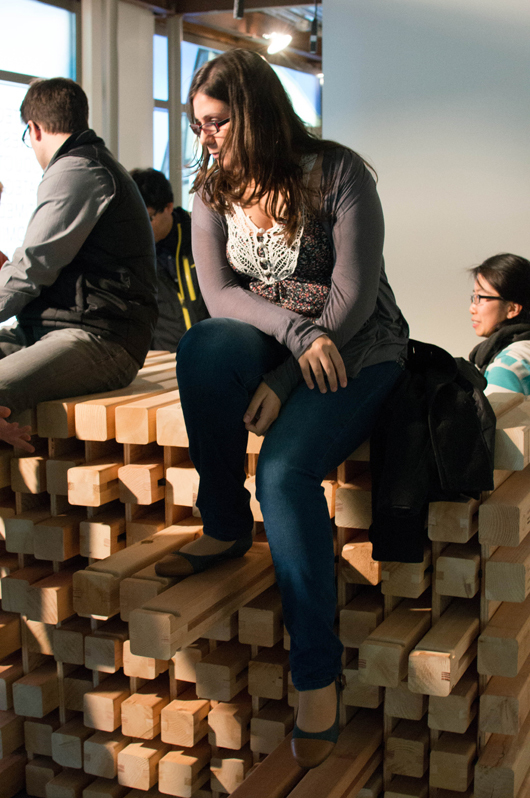 Since being a UO student, her work has been represented as part of the University of Oregon Department of Architecture at the Construction Specifications Institute Forum 2013. She has obtained the Japan Student Services Organization (JASSO) scholarship and participated in an international urban design workshop; as well as presented at the Architecture for Humanity national conference in San Francisco. Working with fellow students, Annie Ledbury, Jackie Davis, and Beth Lavelle, Aaraj and her team won a student-organized charrette to design a clinic in Haiti, (REvive Jacmel), and then developed construction drawings with Waterleaf Architecture, along with other student partners. In December, 2013 she was part of a design-build project in Haiti, with Sergio Palleroni and students from the Center for Public Interest Design at Portland State University. She is currently working on a model of housing and work opportunities for Syrian refugees in Lebanon, with the focus of repurposing the campus to an ecotourism hub, after the end of the crisis. Her active involvement in the field and her intent to stay focused on humanitarian objectives mirrors her opinion that her “world is a world where global change starts from a local action.” As the repertoire of experience in the field for Aaraj expanded these past two years, so seemed to be a consistent interest in empathic design and architecture built with a humanitarian focus in mind. Due to her work in humanitarian design and her interest in language viewed not as a barrier but as an opportunity, in the winter of 2014, Aaraj was approached by the Portland Public School system and asked to be a guest presenter at the International Youth Leadership Conference. The UO School of Architecture and Allied Arts had partnered with IYLC program by hosting the IYLC students’ Mercy Corps-led workshops at the UO White Stag location during the winter months. Aaraj is fluent in Arabic as well as French. She is currently learning Spanish. 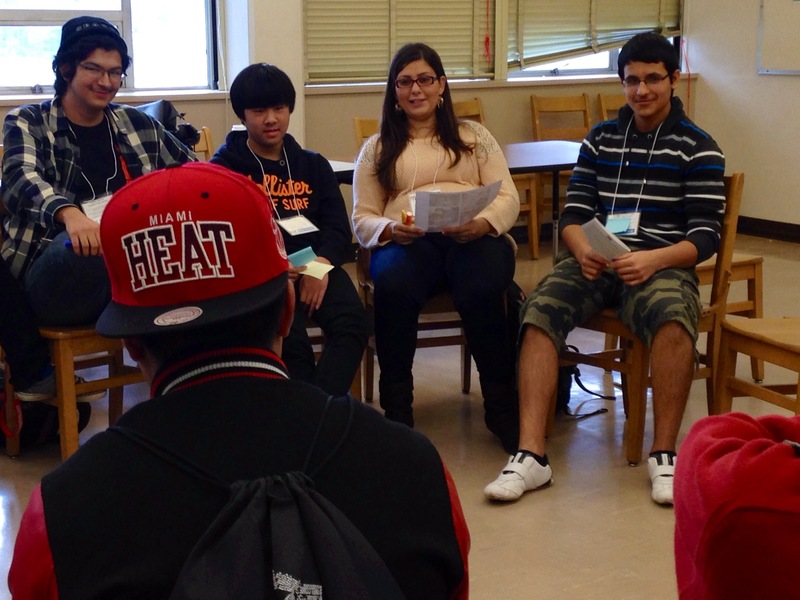 Aaraj was pleased to be offered to interact with high school and middle school age students and quickly formulated an idea to work with them focusing on the topic of language. 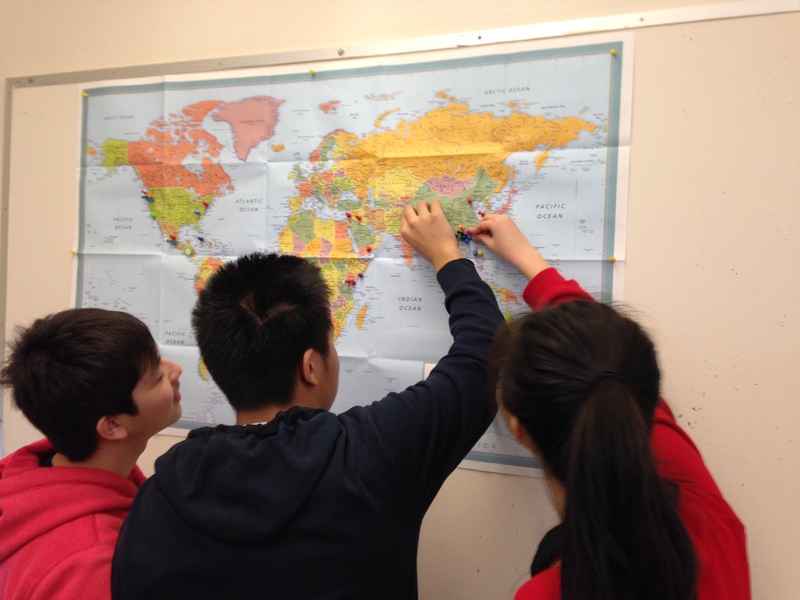 Aaraj’s IYLC workshops, titled “Languages and Traditions: Bringing Us Closer Together” involved inviting the high school students to approach a large map of the world mounted on the classroom wall—students placed a colored pin on the country of their birth and then had an opportunity to discuss and share stories from their homeland about cultural traditions, language challenges they faced upon coming to the United States and ways of communicating in their new environment. “The workshop was like a big living room, a discussion among friends. It started with exchanging names in native languages, writing them and ended with stories and personal participation from everyone. If Grace Aaraj continues with her generosity of character and her willingness to try and “understand the world as a way to understand a region’s history and its people’s traditions,” she will certainly surround herself with her goal of establishing (as she describes it) a “a big living room of discussion among friends.” Aaraj’s story is only one of many of the diverse student body at the UO in Portland Department of Architecture urban architecture studies program. But, like the rest of her cohorts, she reflects a key aspect of the program: that of bottom up design, creating for people, and perhaps, most of all, a testimony to the influence of Portland director of the architecture program and professor, Hajo Neis and his research regarding the Battle for the Life and Beauty of the Earth , recently presented publicly in his collaborative book of the same title. With, as Neis points out, wholeness and in humane ways. While the world might be a vast and complicated place tangled in technology and bursting forth with unbridled innovation, those who have the courage to see it as a tightknit collaboration of real people (as opposed to merely pixels) open to cooperation and kind regard, both in relating to one another and in creating for the built environment could prove to be the “big living room” approach that might benefit us all. See more work by Grace Aaraj on her website, Grace Aaraj. 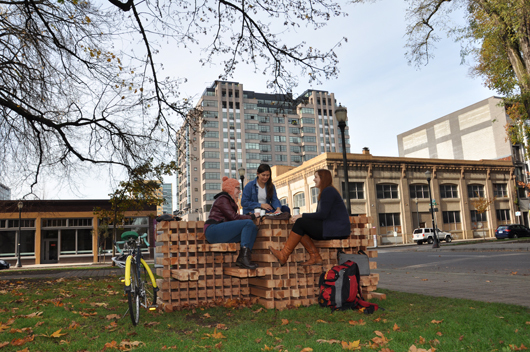 Grace Aaraj (middle) with UO fellow graduate students, Jackie Davis (left) and Annie Ledbury (right) share a picnic on the Bridging Project in the North Park Blocks. All are in the M. Arch Portland Department of Architecture UO.